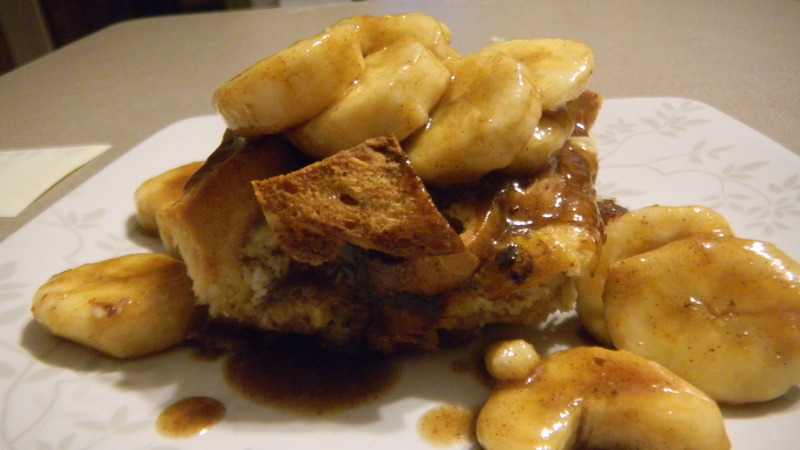 It was a comedy of food errors at my house while trying to make this dish of Bananas Foster French Toast. 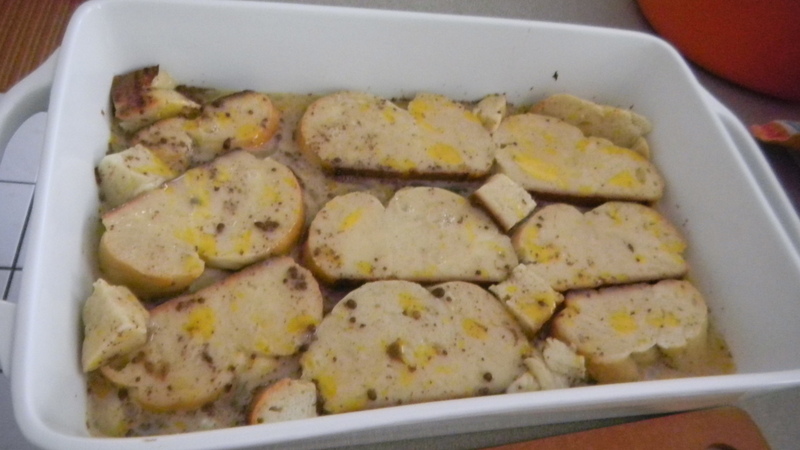 In the end, it turned out delicious, but getting to the end was quite an accomplishment. First of all, you make this with challah bread, not Wonder bread or Texas Toast, which are more readily available at my local grocery store. Because Mariano’s didn’t have challah bread, we decided to make it ourselves. We forgot to do it all day, then, as we were rushing to make/eat dinner before we headed out the door to watch the Illini football game (which wasn’t worth it), we made the dough. It rose while our alma mater was dying a slow and painful football death, and then we baked the bread around 11pm that evening. 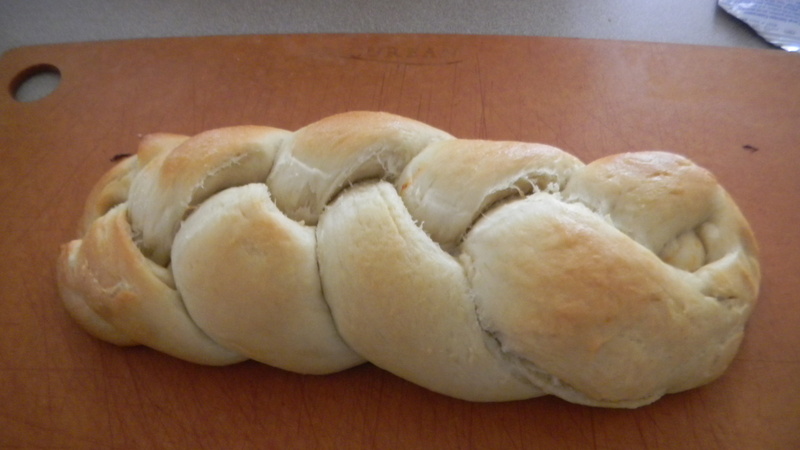 It baked for about 30 minutes and we ended up with a delicious challah loaf. Though it was only a little after midnight, we headed to bed. I woke up the next morning super excited for french toast, and much to my dismay, I saw the recipe called this “overnight” french toast. Overnight? Yep, the bread needed to soak for 8 hours, and preferably, overnight. French toast for breakfast quickly became french toast for dinner once I realized our mistake. 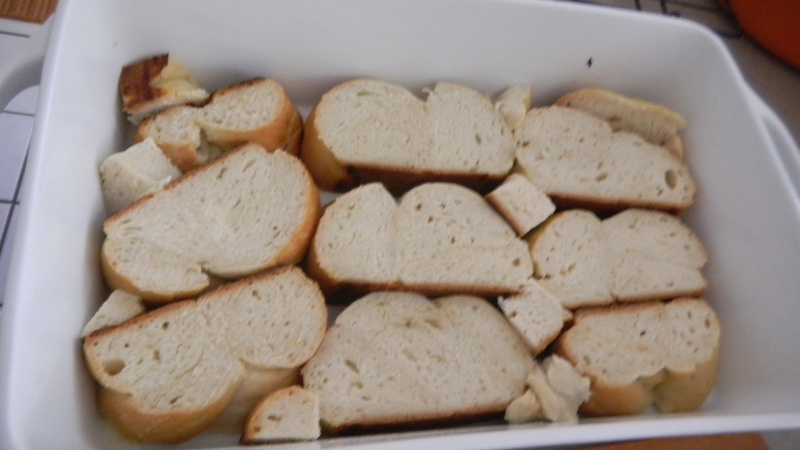 We cut the bread into 1 inch pieces and pushed them into a 13×9 baking dish. 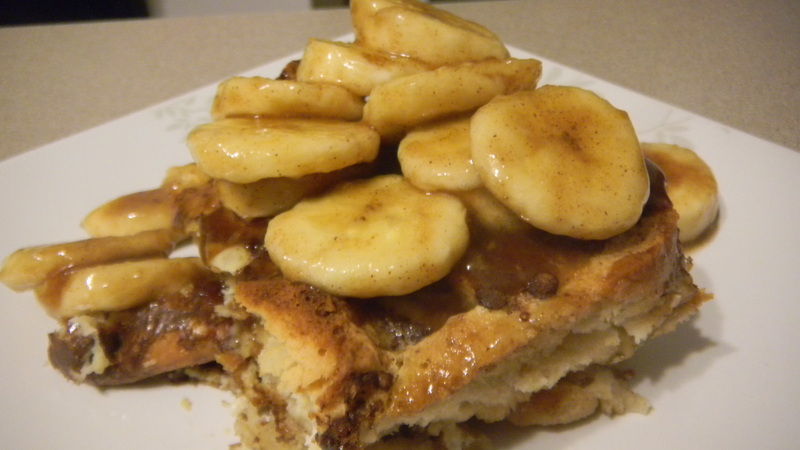 We poured the egg-sugar-cinnamon mixture over the bread and waited. And waited. And waited. Finally, around 7pm, we finally got hungry for dinner. The bread was thoroughly soaked and all was looking good. I couldn’t wait to dig in when I realized that we had again forgotten to make a part of the dish – the topping. 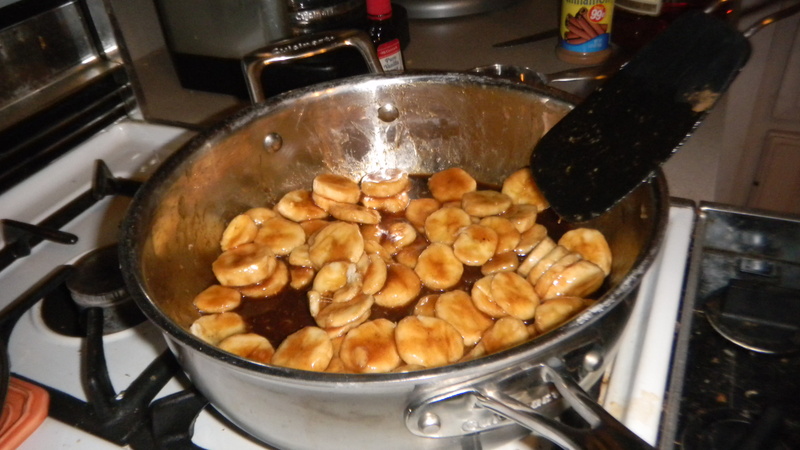 We quickly cut up 4 bananas, melted some butter, added some brown sugar, and about 5 minutes later, the topping was ready. 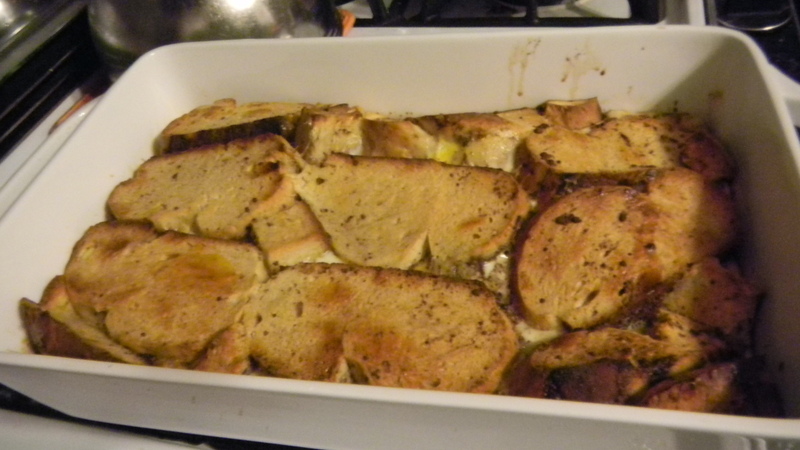 Finally, about 30 hours after we first started preparing to make this dish (shopping for the challah bread that wasn’t at the store), and about 10 hours after we originally wanted it, we finally sat down to eat the breakfast french toast that had become our dinner.